he University of The Fraser Valley Theatre Department has announced the line up of Its 2012/13 season of theatre and all three productions will take place, as they have done for the past sixteen years, in the Theatre on the Chilliwack North campus of UFV at 45635 Yale Rd. It should be noted that the department will also be continuing to offer courses at the Yale Road campus as well as the new studio theatre at CEP in Vedder. The first production of the year will be the hilarious, broad comedy Once in a Lifetime by Moss Hart and George S. Kaufman, which follows the progress of a trio of failing vaudevillians, who attempt to boost their chances of employment by working as elocutionists in a nineteen twenties Hollywood that is in the process of switching from silent movies to the talkies. Once in a Lifetime is a full blown extravaganza, filled with a host of crazy characters and farcical situations that are guaranteed to tickle the funny bones of the most discerning theatre patrons. 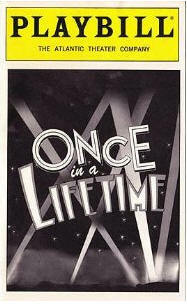 If you liked the Oscar winning movie The Artist, and the classic Singing in the Rain, you'll love Once in a Lifetime, which is the epitome of feel-good entertainment. Runs: November 7 to 25. Next up is Earnestine Shuswap Gets Her Trout, by First Nations playwright Tomson Highway. This is the second play by Highway produced by the department, the first being the popular The Rez Sisters, during January 2000. In Ernestine Shuswap Gets Her Trout we spend time with four First Nations women in the process of preparing a banquet for the arrival of Canadian Prime Minister Sir Wilfrid Laurier. Everything must be perfect for the visit: the Saskatoon pies, the stuffed beaver, and Ernestine Shuswap's trout. The 100 years (from first contact with the First Nations people to the time of Sir Laurier's arrival) are condensed into the time frame of one day. As the day progresses, the women move through a world in transition, as new laws, imposed by the European settlers, create a dreadful chasm between the two communities. Runs: Jan 9 to 27. The third show of the main stage season will be William Shakespeare's The Merchant of Venice. This will be the second production by the department of this often controversial work, the first being during March, 1991. The Merchant of Venice features three of Shakespeare's most memorable characters: Shylock, Portia and Antonio. The Merchant of Venice is a play of many threes: three ladies, three lovers, three cultures, three rings and three wise questions. The play poses many questions: where does love come from? Why do people of different races and religions distrust each other? What is the quality of mercy? Judge for yourself; see The Merchant of Venice. Runs: March 6 to 24. The 2012/13 season will conclude with The Eighteenth Annual Directors Theatre Festival. Once again talented young performers, directors' and technicians from postsecondary programs all over BC will congregate in the Chilliwack campus theatre complex to present their work. An eclectic menu of one act plays will be on offer, ranging through the tried and true to original works created by UFV and visiting students. Runs: April 24 to 29. The department will also be offering another External Study Tour to the world famous Shakespeare Festival in Ashland, Oregon from Monday, June 17, 2013 to Monday June 24, 2013. The plays for this tour are: Taming of the Shrew, King Lear, Cymbeline, Midsummer Night's Dream, My Fair Lady, A Streetcar Named Desire, Two Trains Running and The Heart of Robin Hood. The tour includes travel in a deluxe air conditioned coach, bed and breakfast accommodation in Southern Oregon University residences, all theatre tickets, back stage visits, lectures and workshops as well as several evening meals. Contact tour coordinator Ian Fenwick at 604-795-2838 or via e-mail here. For more information on our season, call: 604-795-2814 or e-mail the theatre here.